In Puerto Rico, Immerwahr shows how US doctors conducted grisly experiments they wouldn't have attempted on the mainland and he shows how, after the Second World War, the US moved away from colonialism in the European tradition, instead devising a new sort of influence that did n... read full description below. For a country that outwardly denies any imperial conquest, the United States owns a lot of foreign territory. Beneath its anti-expansionist rhetoric, the US has quietly created an informal empire. It has dropped bombs, staged coups, meddled in foreign elections, aided dictators, and `Cocacolonized' the world. But what about the actual territories?the islands, atolls, and archipelagos?this country has governed and inhabited? 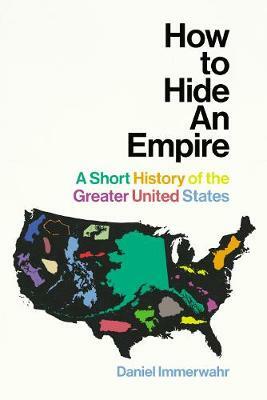 In How to Hide an Empire, Daniel Immerwahr tells the fascinating story of the United States outside the United States. In crackling, fast-paced prose, he reveals forgotten episodes that cast American history in a new light. We travel to the Guano Islands, the home of one of the nineteenth century's most valuable commodities, and the Philippines, site of the most destructive event on US soil. In Puerto Rico, Immerwahr shows how US doctors conducted grisly experiments they wouldn't have attempted on the mainland and he shows how, after the Second World War, the US moved away from colonialism in the European tradition, instead devising a new sort of influence that did not require the control of colonies. Rich with absorbing vignettes, full of surprises, and driven by an original conception of what empire and globalization mean today, How to Hide an Empire is a major and compulsively readable work of history. Daniel Immerwahr is an associate professor of history at Northwestern University and the author of Thinking Small- The United States and the Lure of Community Development, which won the Organization of American Historians' Merle Curti Award. He has written for n+1, Slate, Dissent, and other publications.